What do we do when we have a lot of tasks we need to complete? So we start writing down the tasks and prioritizing them. But it doesn’t always work. We don’t always get to start really working on those tasks, getting things done. Because you’re not using a few simple tricks which make it so much easier to manage a large number of tasks. For example, just look at the drawing, and how it became simple. Visibility is a powerful tool to get things done. 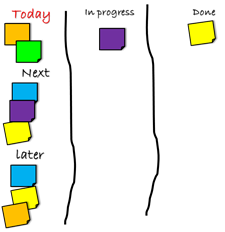 An action map provides both visibility and the simple tool to follow the progress of our tasks easily from a need to do task to a completed one. Especially when we have a lot of them. An action map is something very common used in agile software development teams to acquire visualization a bit ahead to way things needs to look like. You see , in software development , there is always tons to do, plan, change, test, and so on. When we want to get some high level sense of what comes first and what after (without getting into budget , resources and other nosing details) .. we create an action map (using sticky notes) and sort them out into phases. We can use this simple visibility technique for personal objectives too. With our kids, it’s easier to use the action map to create order out of the tasks they need to deal with. We help them visualize the flow things can go. 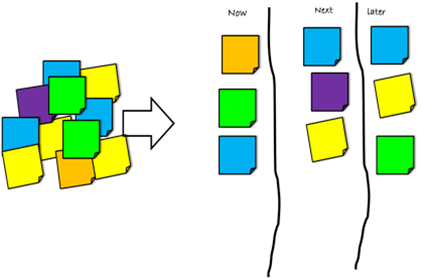 Visualizing “Now, next, later” is an easy way to think of a flow especially when dealing with kids. Visibility works for kids and a basic sense of order and roadmap makes the simplest order we need. Use a white board, wall, or window. Create three columns - Now, next and later. ● Place them on a large action map and order them according to your needs. ● When we want to get into getting things done Start doing one thing at a time, and visualize your progress of doing. ● Every day , consider moving tasks from the bottom to the “now/today” space. As you can tell we can also set scope on one day only, and pick up tasks for the next day without confusing ourselves with more tasks that are not relevant for that day. Agree. A Visual Action Map is an essential tool.